The SSDs are available for sale now, replacing the 840 EVO mSATAs. 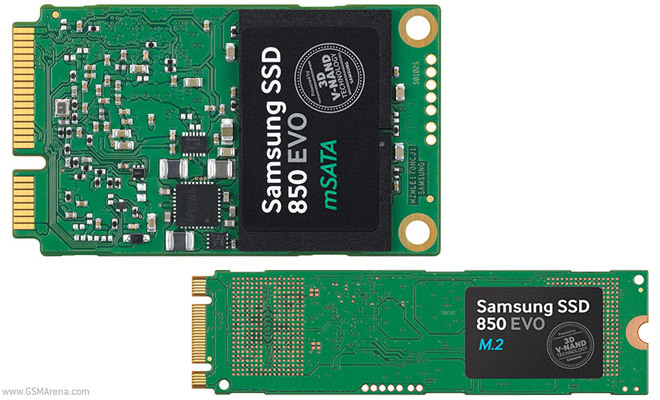 The Samsung 850 EVO mSATA is available in 120GB/250GB/500GB/1TB, the highest capacity drive costs $450. The M.2 drive doesn’t have a 1TB option, only the other three capacities. The 500GB drive is $230. Samsung is advertising 540MB/s sequential reads and 500MB/s sequential writes. The mSATA format is actually a bit faster, doing 520MB/s. For random access the two reach 97,000 IOPS for reads and 88,000 IOPS for writes. The drives support hardware encryption (AES 256-bit) and TurboWrite on the 500GB and 1TB models.